One of the biggest movie-going holidays of the year is Memorial Day weekend, where some of the biggest movies hit theaters to vie for your box office dollars. This year is no exception, with Paramount's Baywatch and Disney's Pirates of the Caribbean: Dead Men Tell No Tales, but with Netflix debuting War Machine in both limited release, and on their popular streaming service, it could be interesting to see if it has any impact on the box office performance of Baywatch or Pirates 5. War Machine comes from writer-director David Michôd (Animal Kingdom), who recreates a U.S. General's roller-coaster rise and fall as part reality, part savage parody, raising the specter of just where the line between them lies today. His is an anti-establishment, pro-soldier exploration in the form of an absurdist war story of a born leader's ultra-confident march right into the dark heart of folly. At the story's core is Brad Pitt's sly take on a successful, charismatic four-star general who leapt in like a rock star to command coalition forces in Afghanistan, only to be taken down by his own hubris and a journalist's no-holds-barred expose. 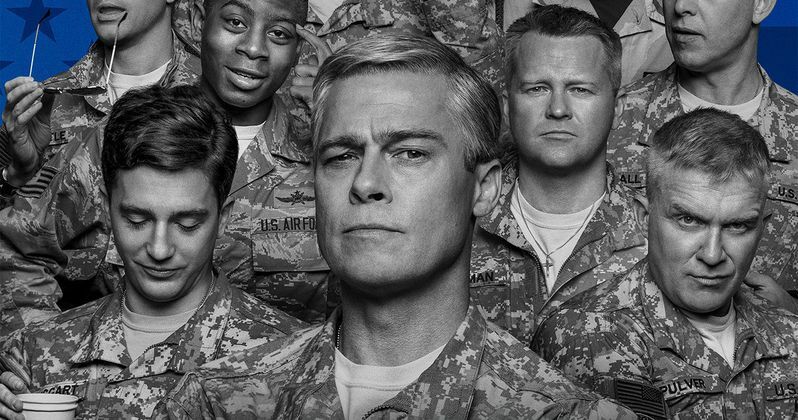 War Machine addresses the debt we owe to soldiers to question the purposes to which they are being directed. The Netflix original film is inspired by the book The Operators: The Wild & Terrifying Inside Story of America's War in Afghanistan by the late journalist Michael Hastings. Joining Pitt in War Machine is a highly decorated cast including Emory Cohen, RJ Cyler, Topher Grace, Anthony Michael Hall, Anthony Hayes, John Magaro, Scoot McNairy, Will Poulter, Alan Ruck, Lakeith Stanfield, Josh Stewart, Meg Tilly, Tilda Swinton and Sir Ben Kingsley. Brad Pitt, Dede Gardner, Jeremy Kleiner and Ian Bryce serve as producers of War Machine, while James W. Skotchdopole and Sarah Esberg serve as executive producers. Netflix picked up War Machine back in 2015, in what was seen as landmark deal at the time, allowing for a simultaneous debut in both theaters and the streaming service. While the movie is arriving a few months ahead of its original schedule, War Machine did pave the way for Netflix to broker huge deals for movies like Bright, which the streaming service paid $90 million for, starring Will Smith and directed by David Ayer, and their recent $105 million movie The Irishman, for director Martin Scorsese and stars Al Pacino, Robert De Niro and Joe Pesci. Take a look at the new trailer and poster for War Machine below.